Life's Journey To Perfection: Sharing Time February 2014 Week 3: My body is created in the image of God. Sharing Time February 2014 Week 3: My body is created in the image of God. Identify the doctrine: My body is created in the image of God. Prepare to have a mirror for the children to look in. Also print out the printable below, "My Body is Created in the Image of God". 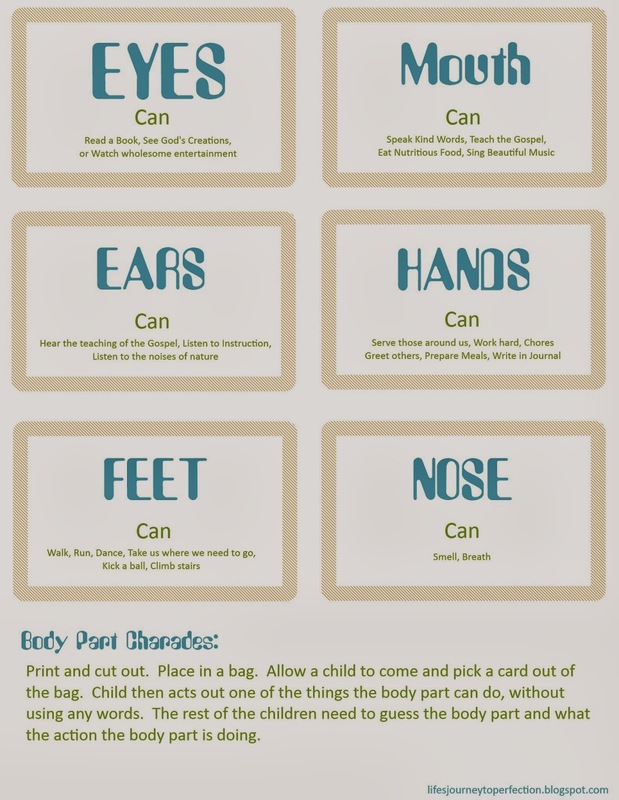 Help the Children Understand the Doctrine: Prepare to play "Body Part Charades", see printable below. Help them apply the doctrine in their lives: Prepare to discuss how we can take care of our bodies. Either have a mirror at the front of the room or pass a mirror around the room. Have the children look at themselves in the mirror. Explain that what they see in the mirror is an image of themselves. Another word for image is likeness. The reflection in the mirror is a likeness to ourselves. 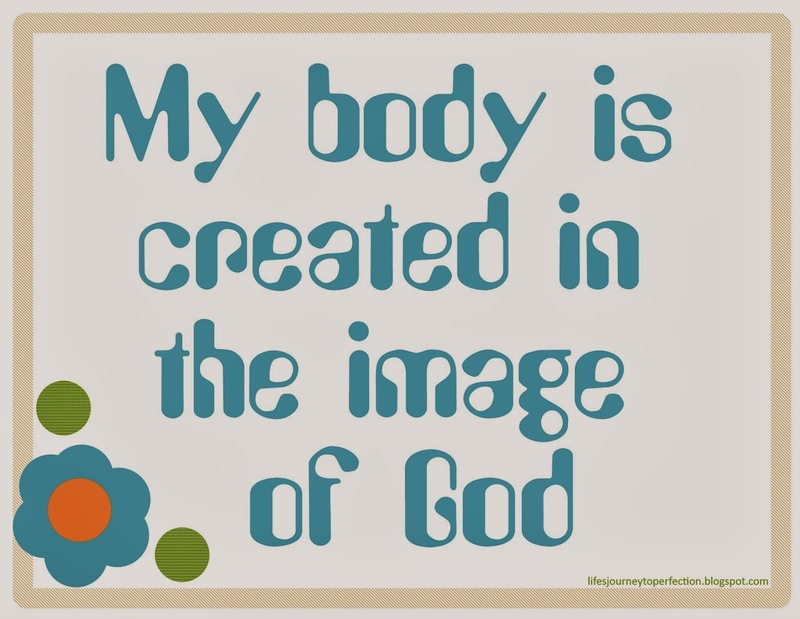 Place the poster on the board: "My Body is Created in the Image of God". Have the children repeat this out loud with you. Explain to the children that when we lived in Heaven in the pre-mortal life, we were just spirits. We did not have a physical body yet. But, our Heavenly Father did have a physical body. Explain that we wanted to have a body like he does, we desired to be like him. When we came to earth we received that physical body, which God created in his image or likeness. Have a bag full of the cards to play charades. Have a child come up and choose a card. Without using any words have the child act out one of the things on the card that the body part can do. Have the rest of the children guess which body part does this action and what the action is. Whoever guesses correctly, have them come up and choose the next card. Continue until all cards have been acted out and guessed. Explain that our Heavenly Father has hands, arms, legs, feet, eyes, ears, etc. just like we do. That our physical bodies allow us to progress and do things that our spirits could not do. They let us experience mortality, so we can become more like out Father in Heaven. Explain that our bodies are a home or a temple to our spirits. Ask the children what are some ways they can take care of their physical bodies? Answers may include: Keep our body clean, Keep the Word of Wisdom by eating good foods, exercise, not partaking of things that are harmful to us, getting enough sleep, etc. Bear your testimony about how Heavenly Father created our bodies in His image. Hello! I just want to let you know that I love your ideas for sharing time and have used them a couple of times now. Thanks so much for sharing your talent! Thank you! Love the charades idea and cards.